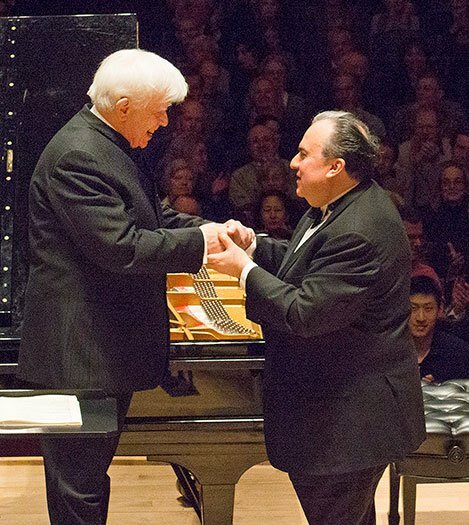 Thursday’s Boston Symphony Orchestra performance, Christoph von Dohnányi conducting, launched the first of three performances of Beethoven, with pianist Yefim Bronfman playing the five piano concertos in published sequence. Next week we also get the Triple Concerto with violinist Guy Braunstein and cellist Alisa Weilerstein. The Overture, the latest composition on the program (not counting concerto cadenzas), sounded the most Beethovenian of the evening’s works—the forthcoming concertos not yet venturing far from shores mapped by Haydn and Mozart. Dohnányi emphasized large gestures, creating tension in the slow introduction which was soon released with an arpeggio dialogue between flute and violins, one that really served to set the stage for the drama to come. With the allegro, Dohnányi established a rhythmic energy that had the orchestra sailing through to the offstage trumpet fanfares, then a freer pace leading to that dramatic close. Dohnányi steered and multitasked most effectively: left hand quieting the first violins, eyes and head cajoling the cellists, baton cuing winds. I couldn’t see what his knees were up to. A rush of ecstatic strings announced the coda, Dohnányi asking for a steely wash of sound from the players (our hair blown back), then urging the brass to match intensity with bombastic fanfare. There were happy arrival, and smooth docking, with return to shore. I’m sure I wasn’t the only one who would later run into the intermission bar, raise a stem, toast the group, and cheer Florestan and Leonore. Beethoven’s first published piano concerto, in C major opus 15, was composed a couple years after the second, in B-flat major opus 19. Like the Overture, the C major sounds more of Beethoven, while the B-flat has much akin to Mozart, particularly in Beethoven’s incorporation and juxtaposition of so many seemingly disparate motivic elements. The C major seems to be one of his first works that display his tectonic style of connecting large masses in musical structure. And that is how Bronfman and Dohnányi approached it. Bronfman delivered the development in broad gesture, hushed, with mysterious tension, richly pedaled but clear. The cadenza, composed much later than the concerto, is the energizer bunny of cadenzas. It’s got Sturm und Drang, a lyrical display of themes, and some bravura, but mostly it just keeps going and going (after you’re sure it’s come to an end, several times). That Beethoven. And as the energizer bunny of cadenzas, it needs some winks. Bronfman played it with the works, but not so many winks, until the big one at the end, when it seems (but isn’t so) that the orchestra has missed its entry and the piano recues with a repeat of a cue chord. There was appropriate laughter from the audience here. Bronfman’s big conception of the work was further evident in the framing of the lyrical slow movement within the outer two, radically different fast movements. The first movement almost stately, the last jocular pub music: bouncy, with bursts of accents on offbeats, and even (with introduction of a theme later in the rondo) bawdy. Bronfman did it all justice, making the theme at once proud and raucous. His playing of the earlier B-flat concerto, tightly knit throughout, emphasized delicate, singing articulation of themes and ideas in the first movement. Following a number of orchestra interludes, his solo playing projected as symphonic, emulating the orchestra, the two hands equal in concert. Beethoven’s cadenza develops the themes of the first movement, but in writing so much like his late sonatas (with many fugal elements) that it’s a bizarre time-travel sort of treat, here dispatched by Bronfman with great expedition and intelligence. Altogether, the playing revealed an extraordinary power of conception, focus, and technique. In the third movement Rondo, Dohnányi and orchestra and Bronfman, all in cahoots, traded carefully orchestrated jabs, punches, and flurries of notes. Funny, though, with the arrival of yet another rondo-raucous Beethoven theme, later in the movement, Bronfman chose to render it more as spidery and mysterious—and sneaky. It worked! Another jolly ending, and then an ovation. Jim McDonald has masters degrees in arts administration and piano performance from the University of Iowa, where he studied with John Simms. He has presented chamber music for 25 years. Does anyone have any thoughts on their not playing the concertos in the order composed and as the composer wanted them understood? Trivially easy to do, of course, and a much more effective dramatic and instructive sequence for the audience. After the exceptional playing on Monday night at Symphony Hall by Bruce Brubaker and Ran Blake, we wondered about the wisdom of presenting these concerti in standard “modern classical” performances with no improvised elements. Brubaker and Blake made the case for spontaneous creation in some beautiful, weird at times, completely alive and alluring playing on 2 pianos. Brave of the BSO to present that event! I believe Bronfman did a small amount of improv, merrily repeating a smudged cadenza ending cadence, a couple of lead-in arpeggios, that sort of thing, but yeah, nothing along the lines of what you’re advocating. David Moran’ s question is interesting. Probably the decision was straightforward (order of publication). But the advantage was that we heard Beethoven in a moment of aridity. As Eichler pointed out in his review, Bronfman and Dohnanyi didn’t try to make it better. So tonight, concerto 3 will feel overwhelmingly inspired, I’m guessing. From Symphony Hall, in my seat. Aridity? There’s nothing wrong with PC 2, if that’s what’s being referred; it is what it is: the first effort, from his late teens, then revised, fortunately from someone who was a major virtuoso pianist and trying to make a career as such. All in fresh shadows of (at least) the two you know whos. …RIGHT! In particular, the cadenza in the 1st mvt of PC 3 on Saturday night was so incredibly inspired that words fail. Bravo, Yefim Bronfman, Maestro von Dohnanyi, and the players!